The most efficient, safe and compact Ultrasound and Radiofrequency platform for non-surgical face lifting, body shaping and skin tightening now available in India. MC1 Multipower is an innovative and efficient platform which combines two different technologies: Ultrasound and Radiofrequency. MC1 Multipower Equipped with 4 different handpieces, each one carefully studied and tested to perform its specific action, MC1 Multipower treats the whole body, from head to toe, reshaping, tightening and lifting. MC1 Multipower uses a patented handpiece, which carries two efficient ultrasound heads for the specific and controlled emission of low frequency ultrasounds at a focused depth inside the subcutaneous tissue. The specific Ultrasound emission, particularly studied for MC1 Multipower, causes a significant shrinking of subcutaneous adipocytes, thereby activating metabolic processes which lead to the natural elimination of the treated fat through lymphatic system, thus fighting against localized adiposity and cellulite, ultimately resulting in a body re-shaping effect. On the other hand, the combined action of Ultrasound and RF, peculiar feature of MC1 Multipower, allows in-depth treatments, which can effectively reduce the skin laxity of face and neck skin. Clinical and histological studies showed that the synergic action of Ultrasound and RF can compact dermis connective fibers, specifically collagen and elastin, thus granting the excellent skin tightening effect. 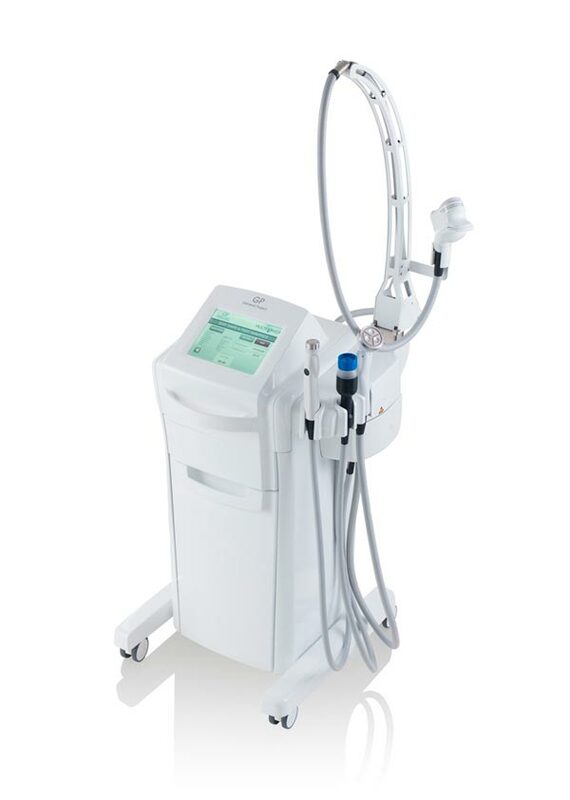 MC1 Multipower is considered to be the best body shaping and skin-tightening machine in India.